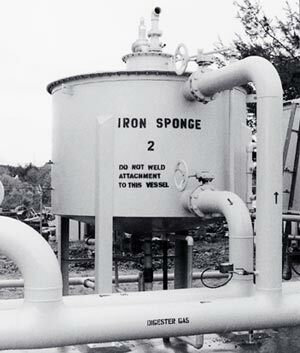 Time-proven, the "Iron Sponge gas sweetening process" has been "sweetening sour gas" in sulfur-bearing gas fields for over fifty years. This is the most effective method of removing hydrogen sulfide from a gas stream. Digester gas passes through the permeable bed containing hydrated ferric oxide. Hydrogen sulfide reacts with ferric oxide, as demonstrated by the following equation, forming water and black, solid, ferric sulfide. A Marcab Gas Purifier will remove all hydrogen sulfide present in gas passed through the vessel. Marcab systems are passive; requiring no operator nor any mechanical or electrical power. Marcab's method of regeneration (U.S. Patent # 4,849,191) requires in-vessel flooding of the media, with water, and subsequent introduction of air bubbled through the flooded bed. The bubbled air starts the reaction of oxygen with the ferric sulfide while the heat of the exothermic reaction is harmlessly absorbed by the water. 24 hours the temperature of the escaping vapor reaches ambient, Marcab Regeneration is complete, and the purifier may be returned to service. Both chemical reactions are exothermic (heat-producing). Negligible heat is generated very gradually during the sulfide removal stage, throughout the life of the media, and dissipates proportionally. Production of excessive heat during unprotected regeneration occurs in only a few hours and cannot be quickly depleted. In fact the insulating quality of the media retains the heat, accelerating the reaction, and without the protection of the Marcab Regeneration Method, may induce spontaneous combustion in the bed.